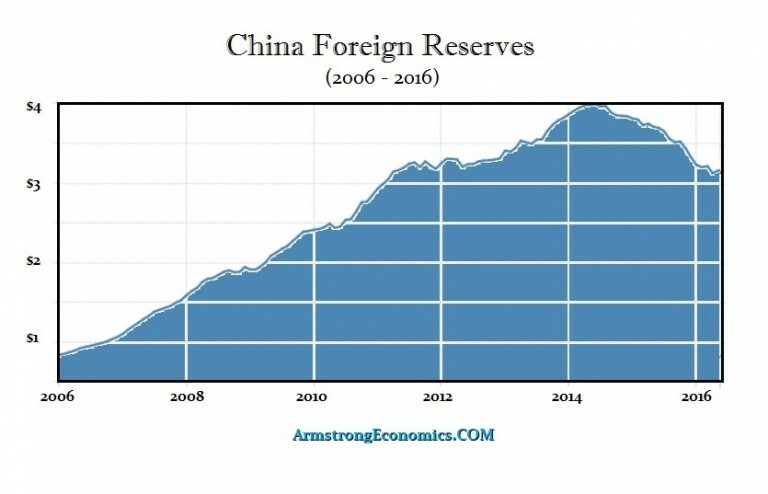 "When China’s reserves decline, it will be because capital had fled China. This is precisely the opposite of what these people are saying. China has sold U.S. Treasury bonds and U.S. equities to raise cash to support the yuan to boost confidence. It has nothing to do with being bearish on the United States. China has no such interest in destroying the U.S. economy or that of Europe. To do so would destroy their own economy and that would only lead to revolution. These scenarios are just pathetic. China has been suffering from a lack of confidence and capital has been pouring out of the country. The Chinese are the big-ticket buyers of real estate in the United States. China’s reserves have been collapsing as capital has fled."